I am just in time to post for SNC this time. For some time I thought I will not be in the blogging world as my site has crashed and just when I think it’s up and about it’s back down in a heap. So I am presently back here to post my current escapades in the food world. Do check out my virtual travel around the India this month. It’s been a hectic trip round the cuisines of India. Right now I am however posting a delicious snack and meal item in my place as Rotis in the morning are generally not acceptable. However you can serve them for breakfast. They are very filling and are originally intended as such. ThanksMinnie and Divya we loved it. Mix the atta, salt and a little oil with water make a soft but pliable dough. Marinate the paneer with all the marinating spices and yogurt, cover and keep aside for 15 minutes to an hour. Meanwhile roast and coarsely grind the masala for grinding. Mix all the vegetables together. Drizzle lemon juice, and sprinkle salt and sugar. Add coriander leaves and green chillies. Using a fork, mix it one more time and serve. Roll out a roti about 4 inches diameter and place the coriander leaves in between. Starting from one side, start folding in the sides, overlapping them over the previous fold. Once the folds are closed, roll it into a ball. Roll out the roti using a rolling pin. It should be roughly 8 inches in diameter. Cook on a tava or griddle. Add marinated paneer and stir until it’s nicely coated with the spices. Let the paneer pieces fry for 5 minutes. Stir them gently every once in a while, making sure they don’t stick to the pan. Now add kasoori methi, onions and tomatoes. Let it cook until the tomatoes soften and the onions look translucent. Serve whole or cut in half with ketchup. You can make all of these overnight. To assemble next day, heat a tsp oil in pan, and heat the roti on both sides. Heat paneer separately in microwave or skillet. 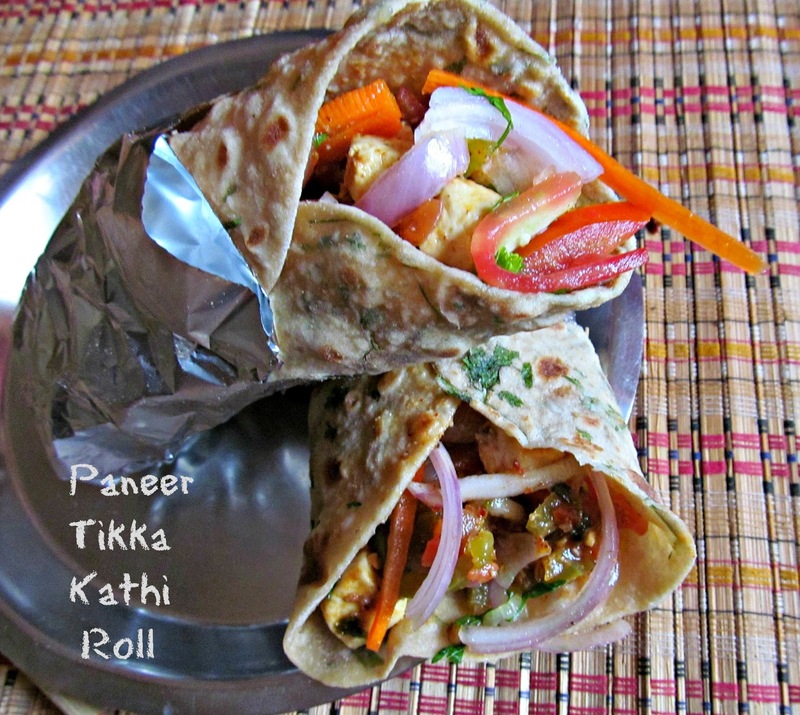 Place paneer and kuchumber in the roti, roll and serve. You can make the rolls in plain roti. Wish i could grab that irresistible kathi rolls from the screen, soo irresistible kathi rolls am drooling here.